I hope everyone enjoyed their weekend! Our weather here has been absolutely beautiful for the past several days so we spent quite a bit of time outside, but I did manage to try out this new recipe in honor of St. Patty’s Day. I borrowed this recipe from SuzyBakes, (posted below) but actually cut it in half because I knew there was no possible way we would finish 2 dozen cupcakes. FYI….if you would like to cut the recipe in half as well I highly reccommend converting the measurements into ounces, and using your food scale because it’s much easier to use half of 6oz then it is to try and measure half of 3/4c etc. Combine your flour, sugar, baking soda and salt into a large bowl and set aside. Bring Guinness and butter to a simmer in large saucepan over medium heat. Add cocoa powder and whisk until mixture is smooth. Cool slightly. Beat eggs and sour cream in a large bowl with an electric mixer. Add Guinness-chocolate mixture to egg mixture and beat until just combined. Add flour mixture and beat on low speed. Divide batter among cupcake liners, filling them 2/3 to 3/4 of the way. Cool cupcakes on a rack completely before frosting. Place the butter in a mixing bowl and beat until creamy. After all sugar has been added, add Bailey’s and milk and blend until just combined. 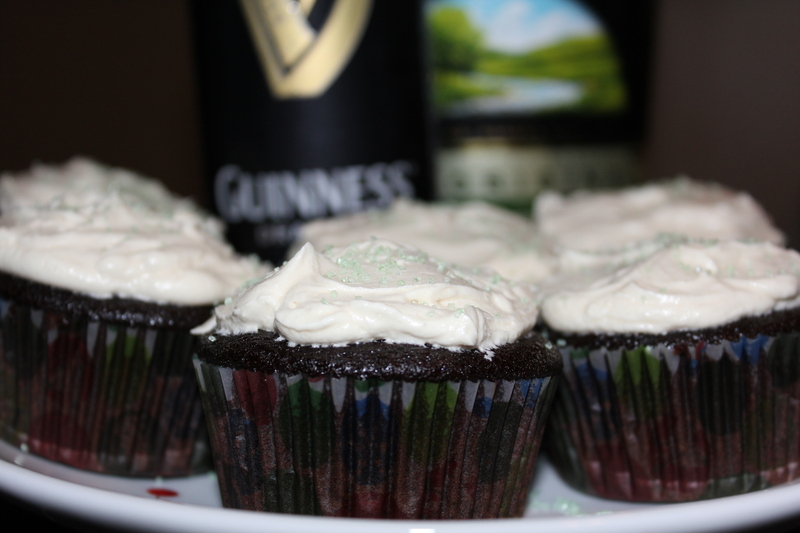 The cupcakes were deliciously rich with just a hint of Guinness flavor, and the sweetness of the sugar blended pefectly with the Baily’s to balance out the entire cupcake….although, just like any chocolate dessert, I highly reccommend a nice cold glass of milk to go along with it! 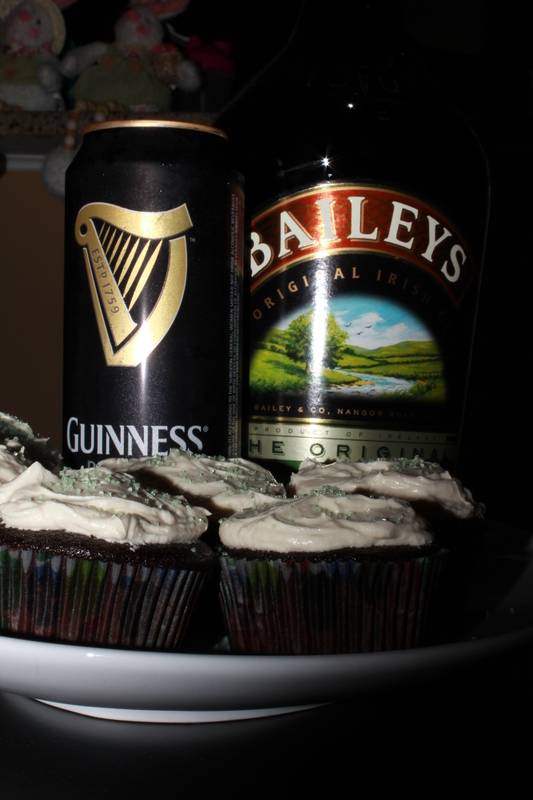 Have you ever used beer or another flavored liquor to bake with?? ?